• Water & Maintenance: Regular watering needed when in direct sunlight. Prefers organically rich and well-drained soils. Prefers full sun, but can tolerate partial shade. • Growth & Spread: Medium rate growth. With an average height around 30 to 40 cm and spread of 20 to 40 cm. 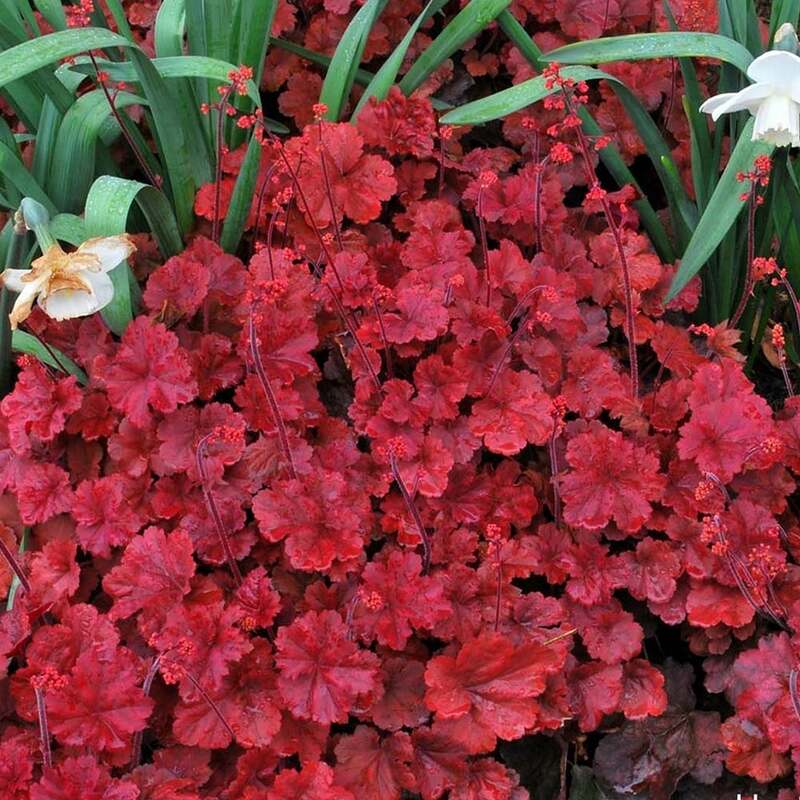 This Heuchera plant is an evergreen perennial. This varietal has a distinctive red colour that permeates the plant. The plant and its associated colour react best when it is provided with full sunlight, but it can also survive in partially-shaded areas, although the colour may then not be as dramatic. Vibrant orange-red flowers are grouped in bunches on top of deep red spires which grow out of the clump of the plant and are distributed throughout the plant’s overall growing area. The flowers are tubular in shape and have colorful calyces adjoining the main bloom. After blooming, it is recommended to clip back the dead stalks in order to allow the plant the best continued growth. Due to their striking colour, these are wonderful accent plants for paths and border areas. They can provide year-round interest with appropriate protection and shelter. It is advisable to mulch in preparation for the winter colds. They have a palmately-lobed leaf with an interesting curled and jagged appearing edge. Suggested uses included accenting within a border area and grouping with other shrubs and flowers to offer contrast with a variety of greens and other colors. These plants can be divided and transplanted about every three or four years.